I achieved my goal and completed my first (and last) marathon on Sunday, roughly in the time I expected. I wasn't going to actually discuss the time (to people who ask my time I usually answer "daytime"), but upon reflection I think it would be good to do so to encourage others who might be slow but considering running a marathon. I ran the race from first to last almost dead-on 13 minutes a mile. That is pretty damn slow, even for an amateur, but for me given I was suffering from osteo-arthritis in both knees and pretty bad plantar fasciitis in my right foot, it was about what I expected. I was more proud that I kept on pace for the whole 26.2 miles -- my second 13 miles was 1 minute faster than my first 13, and my last mile was faster than the first. This was a big change from half-marathons I have run in the past when I pretty much died in the last 20% of the race. The real difference was Galloway's run-walk-run method. I used 3-minute cycles where I would run at about 10-1/2 to 11 minute mile pace for 2 minutes and then walk for 1 minute. I stuck with the program for the whole race, and as a result I was passing a lot of people in the last few miles who passed me in the first few. At one low point around mile ten a 13-year-old girl in a wonder woman outfit zoomed past me, but I ran her down around mile 24 and beat her to the finish line. A very satisfying triumph. In terms of managing my body problems, there were surprising positives and negatives. The cortisone shots I had two weeks before the race on my knees worked fabulously and my knees were never an issue. My plantar fasciitis was mostly kept in check by the arch support I was wearing, though it hurt like bloody hell the next morning when I woke up. I never did find the perfect solution to my underlapping toe and I had to stop twice to take my shoe off and re-tape my toes. I did not have the hunger pangs I experienced on earlier long runs -- the carbo loading for several days in advance really helped and I ate two of these on the way and they were a surprisingly good food for the purpose. The real problem I had in the last 4-5 miles was that my back started to really hurt. Oh, and I also had to resist temptation as I ran past several frozen margarita stands in the last 2 miles (though at the finish I saw a fair number of folks had stopped and bought a cocktail for the last mile). That last point brings me to some encouragement for those thinking about doing this but who are intimidated by being too slow. It took me over 5-1/2 hours to finish and I finished in the top half of all finishers and the top half of all men. I was something like finisher 9,500 out of 20,000. 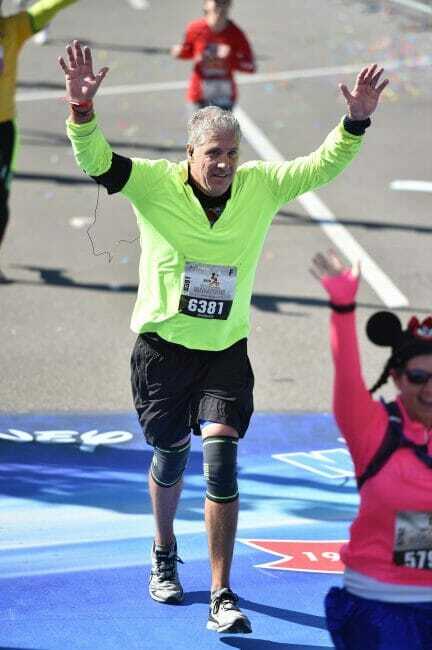 People were still crossing the finish line 2 hours after I finished. Oddly, the only subgroup I did not finish in the top half of were men 55-60, as there seems to be an odd dynamic in these distance races such that there are not very many older folks, but the ones that are there are very serious and on something like their 50th marathon. Some of this prevalence of slow runners is due to the fact it is a Disney marathon and you get a certain crowd for RunDisney events, but I wouldn't be surprised if the same kind of numbers did not obtain in races like the PF Changs. In fact, I can't recommend the Disney races enough. They are well-organized, low-key, and full of interesting distractions along the way such as characters and bands and of course running through theme parks. And the medals are way better at Disney than other amateur races, and you get the fun of many runners in costume. In this race there is even a tradition of having a roller coaster in operation (Expedition Everest) at the halfway point for runners who can jump on the coaster for a ride and then jump back off to finish the race. Postscript: The one problem with the Disney races is that they start at 5:30 AM, though my corral seldom gets to the start line until about 6:00. In this race, the temperature at the start was about 40F, which is super cold for this Arizona boy, and was about 65F at the finish, which means I donated about 4 pieces of clothing along the way as I had to strip as I ran.